HVAC system is very effective to control the cross contamination in both non sterile and sterile pharmaceuticals. 1. Install dedicated HVAC System with appropriate filters in all the process areas. 2. Install suitable airlocks with pressure differentials. 3. Air intakes should not be situated near wet drains, air exhaust or sources of dust. 4. Air supply and extraction points should not be so close or so disposed, that it restricts the supply of clean air to work sites or sweeps dust or contaminants away from work sites. 5. The air flow pattern and recirculated air should be designed to afford adequate protection to the product as well as operators safety. 6. Risk of contaminants caused by recirculation or re-entry of untreated or insufficiently treated air should be minimized. • Separate area for cleaning of filters away from AHU. • Air showers to be provided so that person going out of the Department is free from adherence of a powder. 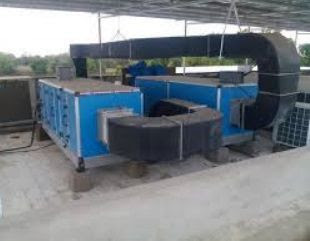 • Clean dust extraction and associated pipes during every product change over. • Areas where beta-lactum products, antibiotics, hormones, cytotoxic, drugs manufactured from live microorganisms are handled, should have a completely separate air handling facility with the scrubbing of exhaust air. • Clean rooms to be designed and classified into different grades as per the type of activity performed. • Clean rooms should be maintained with appropriate cleanliness standards and supplied air should be passed through series of filters of an appropriate efficiency. • Cleanliness level should be maintained to minimize the risks of particulate or microbial contamination of the product or material being handled. • Component preparation compounding and filling operations should be carried out in a separate clean room within the core area. • The clean sweep of air from top to bottom and return of air should be as low as possible to effectively remove any contamination. • An appropriate number of air changes. • Pressure difference should be such that the air flow is from critical to non-critical / less critical areas. • Pass-through hatches and airlocks should be provided for movement of materials, equipment and other goods in and out of the clean room interlocking system, so that only one side may be opened at any one time. • Areas where anti- neoplastic products in powder form are handled, should be at the negative pressure to the immediate external environment and allow for the efficient removal of even small quantities of air born contaminants. • Safety cabinets (Hoods, isolators) used for sterility testing should be negative to the immediate surrounding but should be provided with appropriate HEPA filters at the inflow and outflow of air. • Where sterility testing is carried out under Laminar flow benches, the laminar flow is positive to the surrounding. • Areas where live cultures ( microorganisms, pathogens) are handled, a negative pressure should be maintained to the immediate atmosphere. • Entry via change room. • Changing for entry to the preparation room. • Changing for entry to aseptic filling areas. • Training to cover hygiene and basic microbiology as well as changing for specific operations. • Dedicated garments for both preparation and filling areas. Nonlinting, capable of repeated wear, sterilization laundering without deterioration. Must avoid “ Bellows’ effect as this adds to contamination to the area.